Covered with a sea of ​​large yellowish pebbles, the vineyards of Chateauneuf du Pape offers a unique and timeless view. Walk on the pebbles to get a good impression how difficult it is to work the soil and get the best out of it. 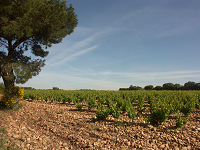 The Vaucluse department, where Châteauneuf-du-Pape is located, has a Mediterranean climate. This type of climate, found throughout the south of France, is characterized by hot, dry and hot summers (34-38 °C) and cool, wet winters. When Châteauneuf-du-Pape became the first French appellation contrôlée wine in 1936, 13 different grape varieties were authorized each contributing its characteristics to: color, structure, fragrance, freshness and longevity. 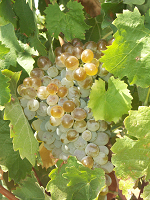 From the late nineteenth century, winemakers have favored and focused on quality of the wine production. They have the means necessary to achieve and in particular are able to implement strict and rigorous cultural practices. 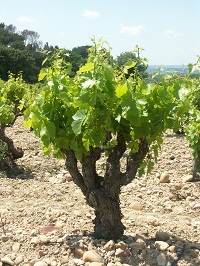 Pruning is performed from December until March, and is a very decisive operation by affecting the shape of the vine and its future performance. 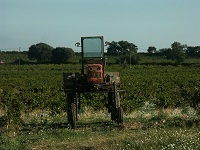 Beyond the legislation imposed by the decree of control according to the Châteauneuf-du-Pape AOC, cultivation techniques are evolving in the direction of greater environmental protection.